Please note: this post assumes you have already found a ghost. The purpose of exorcising a ghost is to get rid of it. Finished, gone, no more ghost. Magic for Skeptics firmly believes that proving the non-existence of said ghost is the most suitable technique for use by skeptics. However, before we get started, you may be interested in hearing how the superstitious go about things. Actually, it's common for ghosts to be treated with great compassion and offers of help. Many traditions believe the ghost is only seeking closure on unfinished business. Perhaps it suffered an injustice or committed one, or was improperly buried. If descendants are responsible for its ongoing well-being in death they may have failed to meet its needs. Alternatively, something may have 'gone wrong' in the transition between life and death. The ghost refuses to let go of life, has become trapped, or it is lost or excluded from the the proper places of the dead. In all these cases, ghost-believers will first attempt to fix the problem, dealing with the ghost as they would a living human. 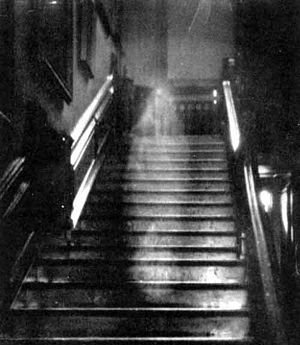 One form of ghost belief that's hard to approach in this way is the idea that a ghost is not a person but a kind of imprint or recording, usually caused by a trauma. In this case, there might be no moral issues involved in erasing it, but doing so is a tricky technical problem because we have no understanding of or access to the presumed recording medium. Standard exorcism procedures require access to a higher spiritual power, in whose name and authority the ghost is banished from a place, using words, holy water or other substances or symbols. Similar techniques are used to bless a space in the name of the higher power, preventing the ghost from re-entering. The UFP doesn't have to be shaped like a person, it just has to convince its observers of its ghostly nature. In reality, they've misinterpreted some other phenomenon or, in a few cases, become the victim of a hoax. Nothing is more satisfying than uncovering a good solid hoax, just like in Scooby Doo. Unfortunately, the skeptical ghostbuster more often finds him or herself oiling creaking doors, pruning over-enthusiastic trees and explaining that Jennifer isn't actually a ghost, she was just wearing a white dress and feeling unwell. Maybe you think I'm exaggerating about that last one? Take another look at Mister Scary of Hammersmith, London, illustrated at the top of the post. He'd been scaring the locals for a while, but early in 1804 vigilante Francis Smith killed an innocent plasterer, Thomas Milkwood, having mistaken him for the ghost. I don't suppose Milkwood was wearing robes and waving his arms above his head as he struggled home from work, but the fact that he was caked in plaster dust was enough for his murderer. Tracking down UFPs isn't always easy as picking up poor Milkwood's corpse. It relies on things like reproduceability, recordability, and miscellaneous detective work. And not all ghosts are unidentified physical phenomena. Some of them are definitely in the 'machine'. Let's take a quick break to think about what's implied by the belief that ghosts are in the world. We would need to assume the existence of what we'll loosely call a 'soul', separable from the physical nature of human beings. In most cases, we'd require the existence of a kind of 'spiritual ether' in which complex psychic information could manifest and transmit itself to the senses or minds of some or all humans. Worst of all, we'd need an explanation of how these things can be matters of common experience AND resistant to systematic observation and investigation. Even worse than that, we'd need to explain why no reliable model of the universe requires or even allows for such a thing. There are no gaps left big enough for sounds and shadows. Absence of proof isn't absolute proof of absence, although an absence of suitable gaps comes pretty close. Either way, it tends to turn us towards a 'mind of the beholder' hypothesis. There is rich ghost-hunting ground in the believer's mind, although it must be admitted that attempts to demonstrate or reproduce ghost-like experiences in the mind have also failed so far. At least in this field we know much lies beyond our current grasp. I suspect ghosts manifest because our minds contain models of people. People we know, fictional characters, sometimes spirits and deities. Sometimes, the models take over and run themselves, especially when they concern people we know well or think about a lot. Most people have experienced vivid dreams involving people they know well. We're also familiar with the extreme difficulty we face in 'ending' our model of another person after bereavement. Like a phantom limb, our model of the loved person continues reacting, experiencing and remembering in an overpowering and uncontrollable way. These kinds of experiences quite naturally transfer into a belief in spiritual existences - that's what they feel like. We also very certainly have 'modes' of being which we use to regulate our own behaviour based on whether we're alone, with intimates, acquaintances or strangers, whether we expect to be under close, friendly or hostile observation. Most of us have also experienced the false activation of one of those modes. We can't reliably sense the presence of a hidden observer, but fiction constantly stimulates our awareness of the possibility. Lots of it depends on our vicarious identification with someone we know to be the victim of voyeurism. Like the phantom loved one, it's an emotionally intense experience and no wonder it's sometimes mis-activated. I suspect all that's required to bring a ghost to life is to create and/or run one of these modes or models on the basis of a very slight stimulus or even spontaneously. Once a place or event starts triggering a ghost-experience, it will very likely establish itself for that person and spread to others very easily through a process of 'social validation'. There are probably all kinds of ways to exorcise this kind of ghost but the question for skeptics is the same as that faced by the superstitious: should you do so? In the sense of researching and popularizing explanations of ghost phenomena, certainly yes, but what if we could prevent the occurrence through therapy of one kind or another? Maybe the answer is that the phenomenon is part of being human and should be left alone until or unless it proves overly disruptive or traumatizing to the person who experiences it.